After logging in to Blackboard, you “land” on the Welcome Tab/Page (also know as My Institution tab). Across the top of that page you will also see a link to the Courses tab/page. Modules on the My Institution tab collect information from all the courses you are enrolled in, giving you a total picture of news and activity for your courses. 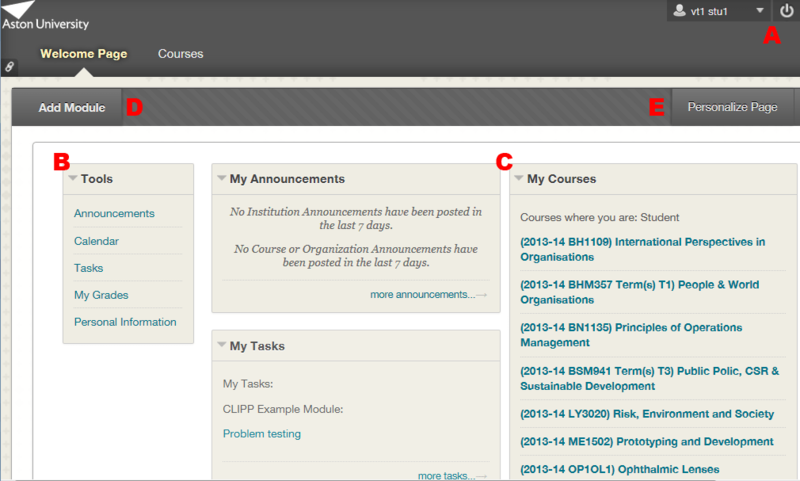 On the left side of the panel, My Blackboard pages display course communication, due dates, grades, and more. A number next to your name indicates how many new items are available. To learn more, see My Blackboard and Navigation. B – Tools: The tools available on this page roll up information from all of your courses. For example, Announcements shows announcements for all courses. Descriptions of the tools are available later in this page. C – Modules: Modules on the My Institution tab collect information from all the courses you are enrolled in or are teaching. My Courses: Access the courses you are enrolled in or teaching. My Tasks: Displays tasks added by instructors. You can add personal tasks when accessing tasks from Tools. D – Add Module: Click to view the list of available modules, such as dictionary, report card, and notes. Descriptions are provided in the list so you can choose the most significant. Your institution determines if you are allowed to add modules. E – Personalize Page: Change the colour scheme of the page. Announcements: Displays announcements for courses you are enrolled in and from your institution. Announcements communicate important, time-sensitive information. My Grades: Displays the status of gradable items such as tests, assignments, journal and blog entries, and discussion board posts. When you access your My Grades page from the Tools panel, you see grades for all the courses you are enrolled in.